A sign for Republican Ron DeSantis' gubernatorial campaign featuring the Star of David is taped on the window of a Jewish deli in Aventura. DeSantis campaigned there on Tuesday, vowing to be a champion for Israel. People sat at diner tables and ate sandwiches and fruit at Mo's Bagels and Deli in Aventura before the campaign event for DeSantis. 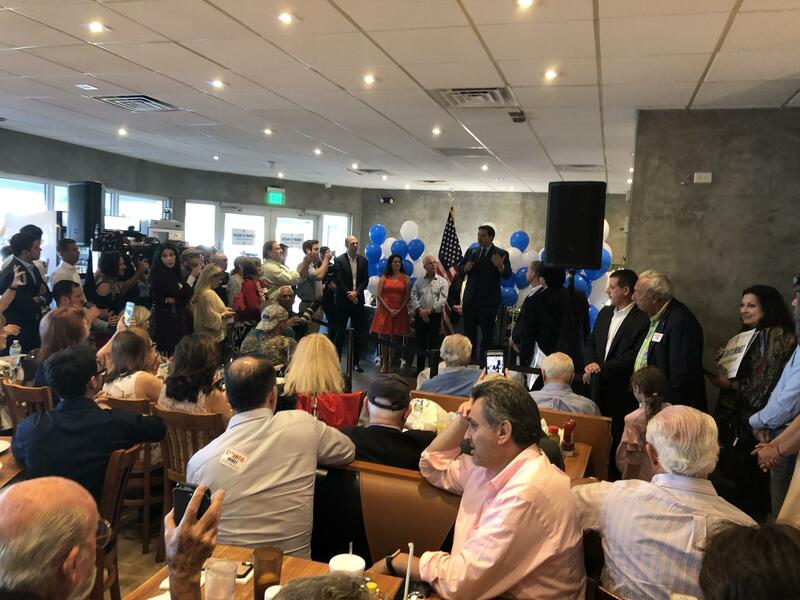 Republican gubernatorial candidate Ron DeSantis told voters at a Jewish deli in Aventura on Tuesday he'd be a champion for Israel if elected governor. Mo's Bagels and Deli was plastered with DeSantis signs featuring the Star of David and filled with blue and white balloons. People wearing pins, hats and T-shirts declaring their support for DeSantis and his ally, President Donald Trump, sat at diner tables and ate provided sandwiches and fruit. They cheered as DeSantis portrayed himself as the best candidate to represent Jewish Floridians and booed at mentions of his opponent, Andrew Gillum. DeSantis called the Democrat's positions "warmed over anti-Semitism." DeSantis touted his advocacy for the Trump administration's recent action moving the U.S. Embassy in Israel to Jerusalem. He said he'd make sure there continues to be a direct flight from South Florida to Tel Aviv and said he'd seek Israel's help in tackling environmental challenges like harmful algae on Florida's coasts. And he said he'd enforce a fairly new law that prohibits the state of Florida from contracting with businesses that participate in the so-called "BDS" movement, which stands for "boycott, divest and sanction." It's a protest effort that seeks to punish Israel for its actions against Palestinians in their controversial ongoing conflict. "As a governor, if somebody, some company, is engaging in BDS. against Israel, I can add them to the list and say, 'If you boycott Israel, the state of Florida is going to boycott you. You're not going to do business with us,' " DeSantis said, as the crowd applauded. "And we'll do that very quickly and very aggressively." Ron DeSantis speaks to a crowd at Mo's Bagels and Deli. DeSantis cited Gillum's connection to a Miami-based activist group called the Dream Defenders, which supports the boycott movement. Dream Defenders is part of a coalition of progressive groups that has donated to Gillum's gubernatorial bid. Gillum's campaign sent the following statement from him in response: "I do not support BDS. … I’ll always support the right to free speech and peaceful protest, but I also believe that any tactics that seek to counter a two-state solution makes our path to peace harder." State Rep. Randy Fine, who represents Palm Bay in Brevard County, traveled to Miami for the event. Fine said he's the only Jewish Republican in the Legislature. Speaking earlier during the rally, before DeSantis arrived, Fine targeted Gillum's running mate and former primary opponent Chris King. The Orlando entrepreneur has apologized for a quote he gave to a newspaper in 1999 regarding his failed bid for a student government position at Harvard University. Then, he explained his loss by blaming the staff of the college newspaper. "I was nailed to the cross. And most of the editorial staff that was so hard on me, the vast majority were Jewish," King, who is Christian, said nearly 20 years ago. He has since called it a "hurtful and stupid comment" that is "completely at odds with [his] beliefs." Fine referenced the quote to the Aventura crowd, which groaned in response. "All of you understand that. 'Nailing to the cross' — that's been a trope that has been used against us for millenium," Fine said. He then added some people have argued that King shouldn't be held responsible for the comment because he said it when he was 20. "People say, 'Shouldn't we let people off the hook? It's what they did when they were in college,'" Fine said. "They didn't think that for Judge [Brett] Kavanaugh, did they?" Several people gathered at the deli said DeSantis' support for Israel was one of the main reasons they plan to vote for him. Early voting has already begun. "Being a friend of the Jews right now is helpful, you know," said Ilyana Stolyar, who lives in Aventura. Stolyar said she's not registered in a political party and has voted for Democrats most of the time. But she believes the Democratic Party is shifting too far left — she sees Gillum as an example of that. That's why she has been more drawn to Republicans recently. She said she's "bummed" the state is losing Republican Rick Scott as its governor; Scott is now in a tight race for U.S. Senate against Democratic incumbent Bill Nelson. She wants DeSantis to replace Scott. "I'm definitely, I would say, a centrist who finds myself homeless," Stolyar said, "and thus, voting for Republicans now." Young people in Florida have registered to vote in big numbers heading into the midterm elections. In South Florida, teenagers and people in their 20s and 30s are organizing phone banks, canvassing tours and social media campaigns in support of both candidates for governor. Here's a portrait of the young voters in our communities who are excited about Democrat Andrew Gillum and Republican Ron DeSantis. They're into board games, science and Andrew Gillum. It’s going to be a marathon for South Florida voters this general election. They’ll run into a long ballot: several candidates for state and local office, a dozen proposed constitutional amendments and all the local referenda.